"Joan Danziger -- Katzen Arts Center at American University"
The two-story atrium of the Katzen Arts Center, aggresively bisected by a large staircase that leads to the upper galleries, has always been a challenge for exhibiting painters and sculptors. Its robust architectural presence can make even the most daring artistic statement appear timid. Yet every once in a while, an artist manages to find an effective way of responding to its imposing sculptural volume and unpredictable angles: recent examples include Sam Gilliam's draped pieces hung from the curved walls and ceiling (2011) and Emilie Brzeniski's monumental wood sculptures, whose rough tree-like shapes appeared alive against the space's stark planes (2012). In both of these cases the work stood its ground because of dramatic scale or contrasting form and medium. What was interesting about Joan Danziger's recent show, "Inside the Underworld," was that it succeeded through deceptively unthreatening rather smallish-looking animal forms. The Washington sculptor has long been known for her phantasmagorical object-stories composed of eccentric combinations of human and animal species, some large, yet many more rendered on a much more intimate, tabletop scale. This time around, she presented a body of work that she has been developing for the last few years -- close to 70 exquisitely crafted beetles. As one walked into the Katzen foyer and then climbed its bold staircase, these objects -- individually, they evoke oversize jewels fashioned through an alchemical marriage of wire and shards of glass -- became ever more present and inescapable, despite their unimposing size. They were everywhere, like an infestation: crawling along walls, climbing all the way to the ceiling, and lying on the floor. Skeletal wire-beetles could be found next to others whose metal armatures were almost entirely covered by shiny glass. There were also humbler-looking ash beetles, some of them rather plain, others painted with carnivalesque zest; horned beetles and winged beetles; and woodland and warrior beetles -- as if an entire imaginary encyclopedia had burst open into the museum interior. Danziger has spoken of this series of sculptures as a continuation of her life-long interest in between-states, whether physical or psychological. Like her signature anthropomorphic objects, her beetles address desires and fears that resist easy categorization. Her interest in this zoological sub-family derives from the human tendency to revere and disdain beetles, to see them as both beautiful and repulsive, pesky things that you can step on and squash, but that can also survive even the most inhospitable of environments. Just as important is her fascination with their immense variety. Granted, her sculpted beetles are never faithful reproductions of natural specimens, but most of her creations begin with close analysis and study of actual examples as recorded in photographs or scientific illustrations. This tension between the real and the imaginary is reflected not only in the diverse media, materials, and techniques that Danziger uses, but also in the names that she gives her creatures. They are as individual in designation as in form: a slender gray Hermit next to a wire mesh Vampire; a boldy faceted Constructivist next to a round-bellied, shiny Scarlet Lily -- each one represents its own fantastical tranformation of a living being. One could consider Danziger's fanciful beetles within a history of zoological representation. The Katzen Center indeed became a Wunderkammer of sorts during the course of her show, a cabinet containing curiosities born of the imagination, a place that invited wonder and celebrated artistic, as well as natural, diversity. "Museum Keeps Things Fresh This Fall"
With tightly focused missions and the strong brand identification that comes from carefully cultivated permanent collections, such museums can’t, or at least don’t, reinvent themselves very often. The American University Museum, on the other hand, likes to keep its audience on its toes. With a lively fleet and flexible exhibition program that focuses equal attention on local, national and international art -- and a healthy respect for the past and the present -- the museum delivers only one thing with great consistency: surprise. Recent shows have included a survey of contemporary female ceramicists from Japan, a spotlight on Spanish design and furniture and a presentation of new work by Washington artist Sam Gilliam. The current shows, five of which opened earlier this month, are prime examples of why the museum, though nowhere near the Mall, is one of the city’s treasures. The first thing you’ll notice is a wall of giant bugs. 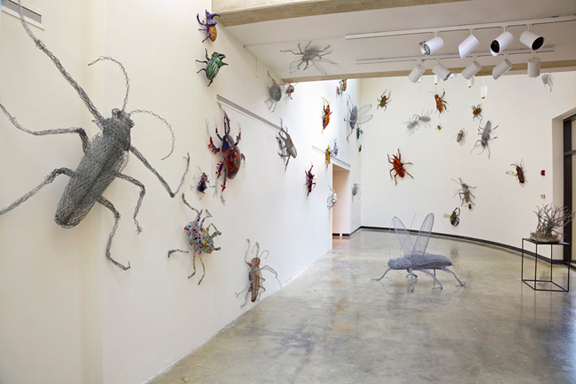 That’s longtime Washington sculptor Joan Danziger’s “Inside the Underworld: Beetle Magic,” an installation of several dozen mixed-media renderings of beetles that makes inspired -- if slightly creepy-crawly -- use of the building’s soaring walls. The building itself, whose curving walls and dynamic sculptural forms have presented art-hanging challenges in the past, has never been better used. "Beetles Invasion: One Artist's Take on the Insect"
"Inside the Underworld: sculpture by Joan Danziger"
When you walk into the American University Museum you'll find yourself in a beautiful, contemporary two-story atrium. You can find this kind of room in most museums and art exhibit spaces that have been built recently, and it's often used for soaring sculpture or a large-scale installation. Joan Danziger's artwork currently installed at the Katzen is both soaring and large scale, and it accomplishes both of these in addition to the fact that it's subject is beetles. There are more than 70 beetles installed in the Katzen's atrium. Some are made solely of wire, some have beautiful glass backs or wings, some have glass mosaics integrated in the wire mesh, a tedious process. Others have plain or painted clay covering their wire bases. You could fit some beetles in your two palms, while a few are six feet across. 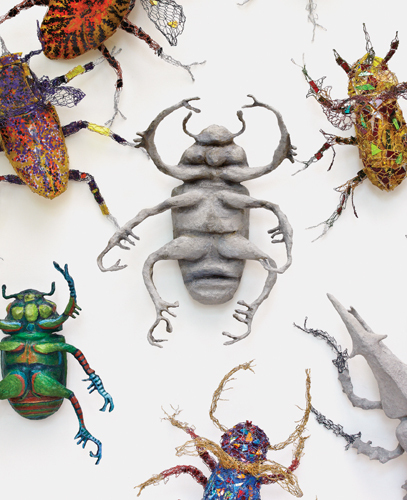 For the last two years Danziger has been making these beetles in her studio. They've been crawling up her walls, laying on her floor, and getting tangled up in fights together. While Danziger was creating the beetles, they had been sitting close to each other. For the installation they're more spread out, with space between each beetle. The choice allows us to see the incredible detail of each artwork. The architecture of the Katzen's atrium is well suited to the installation. When you enter, you see immediately that the beetles have taken charge of the space, crawling up every wall of the atrium, plus the ceiling. As you go up the staircase, you're able to see more detail on each beetle that wasn't clear from the ground. What's clear from this exhibition is the fact that Danziger is a craftsperson of the very highest quality, making charming and captivating sculptures. Her wirework often incorporates multiple colors and shades of metal, which Danziger delicately mixes and twists as a painter would blend their pigments. Many of the beetles have backs made of solid plates of glass, beautifully hand colored. Several are covered in clay and attentively sculpted, requiring firm form construction to support the weight. Danziger's skill is as heightened as it ever was in her more than forty-year career. For most of that forty-year career, Danziger has been working in DC. While most of her work can appear whimsical, if you've followed her career or looked at her larger bodies of work you'll know that Danziger follows greater systems of thought. Take these beetles for example. Each one was not created from Danziger's imagination, but to imitate an actual beetle. (For the budding zoologist, or interested visitor, a brochure lists them by name and photograph.) This artist is interested in the rules and standards of zoology and mythology, in understanding them thoroughly. Danziger may choose to ignore them, but she wants to know the rules she's disregarding before she does so. Joan Danziger’s art has always had the gravitational pull of mystery and magic. 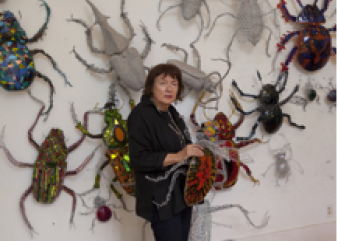 Now, in a new exhibition opening November 3, 2012 at the American University Museum in the Katzen Arts Center, Danziger will unveil the latest twist on her celebrated mythological sculptures by diving into the underworld of the beetle. Featuring approximately 60 sculptural creatures, the installation will showcase a horde of beetles in varying shapes, sizes and iridescent colors, crawling up 50-foot walls in and around the AU Museum to create a strange and creepy world. The exhibition will remain on view through December 16, 2012. Over the course of her career, Danziger has combined her interest in the animal world with the beauty and mysticism of nature. Inside the Underworld introduces her newest riff on this theme as she explores a fresh group of subjects—beetles—with the playful fantasy and whimsy that has come to define her work. Fascinated by both the cultural myths of the beetles, which date back to the ancient Egyptians, as well as their physical ability to materialize mysteriously from underground, Danziger infuses each one with magical purpose and meaning. Made out of Danziger’s usual technique, which consists of wire, celluclay and paint, the sculptures also incorporate a new material: fused glass. This is the first time Danziger has used glass in her work and she was inspired to experiment with glass for the exhibition at the AU Museum. The process is multifaceted as she cuts the highly colored glass into various shapes, which are then fused in a kiln. Afterwards, they are set into wire or are slumped again in a kiln for a beetle shape. Danziger likens the process to abstract paintingas she searches to create the iridescent and metallic colors of the beetles. As in the real world of insects, no two of Danziger’s beetles look the same. Danziger's recent series of sculptures, referred to as Mythic Landscapes, evokes mysterious and poetic worlds. They are imaginative inventions that draw upon her fascination with dream imagery and metamorphosis. As in October Gathering, Danziger's quiet forest settings are inhabited by unusual combinations of animals and people. The way in which she juxtaposes the forms and her dynamic use of scale adds to the impact of these magical and narrative landscapes. The artist has stated that this interplay between spirit and human form has influenced her work for many years. October Gathering was recently cast in bronze at the Johnson Atelier. The original mixed media work was included in The Sculptors Guild group show held at Grounds For Sculpture in the summer of 1999. Danziger received a B.F.A. from Cornell University and also studied at the Art Students League in New York City and the Academy of Fine Arts in Rome, Italy. She is a resident of Washington, D.C. Her highly original artwork has been shown at museums and commercial galleries in California, Florida, Texas, New York, and many other states. Local venues include the Morris Museum, Rutgers University, and the New Jersey State Museum. She is represented in collections at the New Orleans Museum of Art; the National Museum of American Art and the National Museum of Women in the Arts in Washington, D.C.; and the Susquehanna Art Museum, Harrisburg, for example, plus other public and private collections. "Joan Danziger: Mythic Landscapes, Fantasies With a Subtle Edge"
Odds are you've seen Joan Danziger's art. If you've lived in the Washington area for any length of time, you're likely to have passed at least one of the public commissions the local sculptor has become known for since arriving in the city 40 years ago. Driven up Seventh Street NW lately? Several of the sculptor's oversize, whimsically anthropomorphic animals swing from trapezes hanging from the ceiling of the Kennedy Recreation Center, between O and P streets. You can't miss them. Her latest work, on view at Osuna Art, is different, and more subtle. Oh, the figures are still sometimes half man, half beast (look for the tiny, seated birdman in "Absorbed into the Trees"). It's just that the whimsy is pretty much all gone. "Joan Danziger: Mythic Landscapes: Recent Sculptures" is mostly about trees. Strange, scary trees. Twisty-rooted, closely clustered trees. Walking among the dozen bonsai-size sculptures at Osuna, you might feel a little like Dorothy in a miniaturized version of the forest scene from "The Wizard of Oz." One tree ("Temple Spirits") even has a face. Not that Danziger is trying to creep anyone out. Her long-standing interest in the theme of metamorphosis -- in the blurring of boundaries between the human and the animal, between flora and fauna -- is more magical than macabre. It rises from the artist's belief in the interconnectedness of life. In the sense that there's something alive and seething in every rock and branch. Ancient Greek and Roman myths, Native American folklore, the art of Hieronymus Bosch and William Blake, all that and more goes into Danziger's stew of ideas. It's a surprisingly potent recipe . . . for dreams, if not nightmares. Roughly sculpted in lumpy Celluclay (a self-hardening modeling material) over sometimes exposed chicken wire, Danziger's fantastic landscapes call to mind discarded sets from a Claymation version of "The Chronicles of Narnia" or "Where the Wild Things Are." Caped figures race by on horseback in one; tusked creatures root among exotic-looking jungle vegetation in another. Paint, sparingly used here and there, accents the Celluclay's neutral gray tones, giving the work a misty, twilit feel. The sculpted figures are not, however, the stuff of children's bedrooms. "My work," Danziger says, "is inhabited by spirits." She's right about that. There's a haunted quality to this art that gives it a welcome, grown-up edge, a bite. If it evokes fables and fairy tales, it's closer to the darker, Freudian undercurrents flowing through those juvenile literary antecedents. More Bruno Bettelheim than Berenstain Bears. Just don't try to read specific narratives into Danziger's work. Drawn from her imagination, they're meant to fire ours. Put another way, they inspire myth, not illustrate it. "People come out of it with their own stories," she says. "The Emblematic World of Joan Danziger"
Joan Danziger’s uncanny sculptures do not fit into today’s fashionable art scene. Conjuring mythic, almost romantic worlds, they are the exception that proves the rule of the spiritual crisis that Donald Kuspit sees in contemporary art.1 Robert Rosenblum’s argument in Modern Painting and the Northern Romantic Tradition (1975) also comes to mind.2 In his alternative history of modern art, an important northern European mystical tradition greatly influenced artists in both Europe and America. This pioneering work opened up a line of thinking that now allows us to take for granted the landscape allusions and spirituality of Rothko and Newman. Danziger’s work fits readily within this family of influence. But, unlike the Romantics of an earlier period, who aspired to discover secreted certainty behind the illusion of life, Danziger transports viewers into zones of ambiguity. Her strange characters refuse a unitary resolution and instead function as symbolic depictions of emotions and experiences. Her oeuvre reveals an artist awed by the power of nature and fascinated by mythology. Despite the fantastic qualities evident in these puzzling works, her inspiration, in part, stems from a knowledge of tree species from around the world. The tree is a distinct symbol in Jewish and Christian mythology, placed at the center of both the divine and the earthly Eden. Both a feminine symbol, bearing sustenance, and a masculine one, visibly phallic, trees embody longevity and endurance and are often identified with strength. Their formal structure has long captured the human imagination, the monumental vertical thrust toward the sky linking heaven and earth, while the mirroring root network reaches all that is hidden beneath the earth’s surface. More prosaically, they are places of shelter and sources of nutrition and useful materials. Each of Danziger’s assemblages contains familiar forms as well as impenetrable tales. Recognizing the supremacy of nature and time’s inevitable effect on all matter, her magical constructions evince a poetic innocence. Before turning to three-dimensional work, she was an abstract painter, and she believes that her knowledge of abstraction’s formal language persists regardless of her current realism. Balance and order remain the foundation for works that hint at chaos and urgency. Themes of temporality, natural imbalance, and life’s majestic power inform Danziger’s recent sculptural series. An indistinct silence veils each self-contained and symbol-filled metaphorical world. Each organic arrangement contains an enigmatic language of abstraction and representation inspired by nature, allegory, and private reflection. "Art & Artists: Joan Danziger"
There are certain shows which those of us who have lingered long in the DC arts scene will always remember. One of these was Joan Danziger’s sculpture show at Henri Gallery in the early 1970s which included parrots riding bicycles, suspended in the air. Boldly conceived creatures hung like acrobats disproportionate to life, comic and ornamental. These brightly painted suspended sculptures began her “Sculpture Series,” revived even now from time-to-time by the artist. Another series saw creatures playing musical instruments. Butterfly Man, who is more female than androgynous, floats over a well-known educator’s table, playing a tuba from which is crawling a baby alligator. One could picture poet Wallace Stevens as being envious of such a dining room installation. 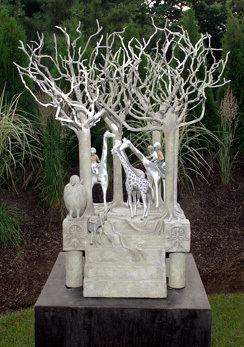 In her cathedral ceiling studio sits in the making a two-tiered sculpture of giraffes being ridden by small figures within a grove “like a coven,” a circle of trees whose roots grow and writhe like snakes where a gigantic bird waits at steps leading down to the lower tier; all is gray waiting to be painted by the artist with more details to come. On another table stands yet another two-tiered sculpture in the making with griffins, one rearing, another ridden by a person. Below them turtles roam among the roots of towering trees, exotic Hawaiian-like flowers are being build, piecemeal, to out-loom the very trees themselves. A mythology of delight is bringing Joan’s wit to full composition. Joan’s original sculptures stemmed from fantastic and comic pen and ink drawings; they started to become more and more heavily modeled with shade, giving the illusion of three dimension. The next step was for them to come to life and float, suspended from ceilings of many buyers. Her love of bright color went from paper to sculpture. Working with shaped armatures of chicken wire and stretching canvas over these forms, Joan is able to bend them to her designs after which she coats them with celluclay which dries permanently hard in sunlight. One of Joan’s arrangement of a jungle of flowers looms larger than life like the flowers in a Rousseau painting and gives a touch of the fantastic to Corcoran visitors where it is on indefinite loan. And, until April 16, Joan’s flowers are on view in Michael Clark’s “Flower Show” in his gallery at the Foundry in Georgetown. Then, opening May 5 at the Museum of the Americas, Joan will be represented with two sculptures, October Gathering and Still Life. That show will run through July 2. The reason we have not seen many shows until now I that Joan has been working mainly for commissions. She has also shown her “Interior Tableaux” series at the Textile Museum, with simulated carpets as part of the sculptures, and twice at the Renwick as well as at the Corcoran. Her work is also represented in several state museums. We should all be looking forward to seeing these new works of an artist who has quietly and fantastically worked among us. "New York Reviews: JOAN DANZIGER (Terry Dintenfass)"
For a brief period, this gallery was inhabited by a serious and dignified population of animaloids. Larger-than-lifesize human figures with animal heads were accompanied by proportionately outsized pets such as cats and warthogs in evocative, slightly unsettling and strangely beautiful tableaux. Danziger paints the dull surface of resin-dipped cloth that is her modeling material in generally subdued natural colors, drawing in details with pen or pencil. Brought to life, these figures in suspended motion would probably move in the spirit of the lithe and suggestive Beatrix Potter animals in the Frederick Ashton ballet on this theme. Rhinoceros, antelope, bird and cat heads, some affixed above human heads – define the mystery at the core of the figures: one cannot be sure which way they are evolving, if at all. The evidence from the variety of poses and situations, points toward humans seeking their cat-or bird-or – yes – rhinoceros-natures. The coexistence and cooperation of the creatures in peaceful or bustling pursuits has an almost utopian ring to it. In Procession, a jaunty if disorganized group of unpainted penguins carry on their heads a horizontal human body with a head showing both human and bird features. The naturally upright bearing of the penguins gives them an ironically human edge. In Waiting Room, antelope- and rhinoceros-headed humans wait with their warthogs; the rhinoceros has an extra antelope head o his lap—for a change of character, perhaps. In Aurora Catlin, a human cat holds two regular cats while a dog sits on the floor beside them as a human would sit. There are wall pieces that lack faces altogether, such as Elena and Friends, a featureless girl holding three cats, and Megan—The Dream Lady, who holds a colorful fish. These sculptures are not light, although they don’t lack humor. They are highly imaginative, with the strength and depth of parables left unexplained and some of the fatefulness of myth.